b. Former Deputy Director for Cultural Affairs in the Department of Antiquities and Museums – Ministry of Information. c. Former Curator of Islamic Art Museum "Dar Al-athar al-Islamiya", Kuwait National Museum, Sate of Kuwait. (Grant from the Aga Khan Programme Islamic Architecture - AKPIA)-Department of Islamic Art-Harvard University, Cambridge, Massachusetts-U.S.A.
2005-Jan 2007 Extension of the above Post Doctoral Fellowship. A joint program between the Fine Arts and the Center for Middle Eastern Studies departments-Harvard University, Cambridge, Massachusetts, U.S.A.
Beirut University College (B.U.C. ), presently Lebanese American University (L.A.U. ), Beirut,Lebanon. American University of Beirut(A.U.B. ), Beirut- Lebanon. American University of Beirut (A.U.B. ), Beirut- Lebanon. American University of Beirut (A.U.B. ), Beirut-Lebanon. 1982-1984 Associate-curator at the Islamic Art Museum "Dar al-Athar al-Islamiyya" Kuwait-National Museum- Department of Antiquities and Museums, Ministry of Information, Kuwait. 1984-1990 Curator at the Islamic Art Museum "Dar al-Athar al-Islamiyya", Kuwait National Museum-Department of Antiquities and Museums, Ministry of Information, Kuwait. 1991-1994 Researcher at the Kuwait National Museum - Department of Antiquities and Museums, Ministry of Information, Kuwait. 1994- July,2000 Deputy Director for Culture, Department of Antiquities and Museums - National Council for Culture, Arts and Letters - Kuwait. July 2000-2001 Director of the Department of Publishing and Distribution-National Council for Culture, Arts & Letters, Kuwait. July 2000-2001 Member in the editing committee of the monthly series of “Άlam al-Ma’rifah’, issued by the Department of Publishing and Distribution-National Council for Culture,Arts & Letters, Kuwait. 2001 – 2002 Founder and Director of the Department of Resarch and Cultural Studies-National Council for Culture, Arts & Letters, Kuwait. 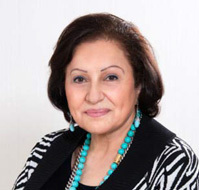 May 2004 – 2012 Vice-President for West Asia Sub-Region, World Crafts Council-Asia-Pacific Region. Nov. 2009-2012 Senior Vice-President, World Crafts Council-Asia-Pacific Region, and Vice-President for West Asia Sub-Region. President – World Crafts Council-Asia Pacific Region for the term 2013-2016. 1986 1. Co-writer of a catalogue accompanying the exhibition “Science in Islam”, Dar Al Athar al-Islamiyyah, Kuwait National Museum, Published by the Ministry of Information, Kuwait, 1986. 1987 2. Writer - “Variety in Unity” (Arabic and English) Published by the Ministry of Information, Kuwait,1987. (Translated into French). The part on Islamic coins prepared by Dr. Ramzi Bakh’azi. [Prepared for an exhibition from Dar al-Athar al-Islamiyyah Museum, during the Fifth Islamic Summit in Kuwait]. 1990 3. All entries for the objects (except Jewelry) in a touring exhibition stated in the book “Islamic Art and Patronage-Treasures from Kuwait”.This book was prepared for a touring exhibition which toured Russia, U.S.A., Europe, Australia and Asia. Published by Rizzoli International Publication, New York, 1990. 1992 4. "Our Identity: Cultural Heritage" " هويتنا: آثار وتراث" Published by the National Council for Culture, Arts & Letters, Kuwait, a-1st ed., 1992 (Arabic, English); b-2nd ed., 1998 (Arabic). 2000 6. "Dickson House" "بيت ديكسون" (Arabic), a booklet published by the National Council for Culture, Arts & Letters, Kuwait, 2000. 2001-2012 7. “Islamic Textiles” “المنسوجات الاسلامية”, Published by Kuwait Islamic Arts Center, 2011/2012 (Arabic/English). Forwarding and editing. 8. In the process of writing a book on “Paramount Gems in Islamic Jewelry”, to be published by Harvard University Press, Cambridge, Mass., USA. 2. “The Terracotta Figurines”, Volume I. The series of the results of the Danish excavation team in Failaka Island-State of Kuwait. Published by the National Council for Culture, Arts and Letters-Kuwait, 2002. 2001 4. “Zumurrud” (Emerald), Article in the Encyplodedia of Islam, 2001 (English). 2012 6. Article “Memories Collected for a book to be published by Dar al-Athar al-Islamiyyah in Kuwait. 1. “The Mashrabiyya and Stained Glass - in Kuwait Architecture” (English), to be published in the proceedings of IRCICA Islamic Crafts Conference in Cairo,1995, on "Mashrabiyyah and Stained Glass in the Islamic World". Arabic Translation published, 2002. (This is when (1995) I joined WCC-APR as Individual Member). 1997 2. Lecture on the Ancient history of Kuwait and the Archaeological excavations in Failaka Island during the cultural season of the National Council for Culture, Arts and Letters at Jahra City in Kuwait, 1997. 2002 6. Lecture on “Paradise & Hell in Islam”. Prepared for a Colloquium in Keszthely-Hungary, 7-14 July, 2002. ( English) To be published. 2002 7. Lecture on “ The Influence of Islamic Arts and Crafts on European Arts”, for the International Congress on Islamic Arts and Crafts organized by IRCICA, in Isfahan, 4-9 Oct,2002 (English) To be published. 2004 8. Lecture on “The Islamic Art and Eurorpean Arts” at the American University in Beirut (A.U.B. ), Beirut-Lebanon (Arabic), January, 2004. 2004 9. Lecture on “Islamic Pottery: Influences and Innovations” at the Lebanese American University (L.A.U.) – Beirut, Lebanon (Arabic), May, 2004. 2012 14. Presentation “Crafts Education in West-Asia Subregion”, in the International Conference in Bangkok-Thailand (cancelled). Regional Assembly WCC - APR in Bukhara/Uzbekistan, May 2005. Report on West-Asia Crafts Activities read on my behalf by Ms. Faiqa Sibai, the former Vice-President for West Asia, World Crafts Council -Asia-Pacific Region (APR). 2006 Regional Assembly WCC - APR in Kuala Lumpur/Malaysia, May 2006. Report on West-Asia Crafts Activities. 2007 Regional Assembly WCC - APR in Bangkok/Thailand, September 2007. Report on West-Asia Crafts Activities. 2008 General & Regional Assembly WCC - APR in Hangzhu/China, November 2008. Report on West-Asia Crafts Activities. 2009 Board Meeting in Bangkok/Thailand, November 2009. Report on West Asia Crafts Activities. 2010 37th Regional Assembly WCC - APR in Kuching, Sarawak-Malaysia, Sep 2010. Report on West-Asia subregion. 2011 33rd Regional Assembly WCC - APR 2011 in Daegu-S.Korea. Report on West-Asia Subregion. 2012 34th Regional Assembly WCC - APR 2012 in Chennai, India. Report on West Asia. Paris/France: Exhibition 1996, from the Islamic Art Museum in Kuwait. 1996 Istanbul/Turkey:Exhibition, from the Islamic Art Museum in Kuwait. 2009 Bangkok/Thailand: Board Meeting W.C.C.-APR Nov. 9, 2009. 2009 Bangkok/Thailand: Workshop on Basketry, UNESCO/APHADA in Ayuthaya, Nov. 8, 2009. 2010 Kuching, Sarawak/Malaysia, Sept. 2010, APR Regional Assembly. Miri, Sarawak/Malaysia, Oct. 2010, Beads Exhibition. Colombo, Srilanka, Oct. 2010, Opening of Siva Obeyersikri’s Arts & Crafts Gallery. 2010 WCC Board Meeting in Lusaka-Zambia, Oct.2010. 2011 Inaugural speech at Embroidery and Patchwork International Festival in Gölcük, Turkey, June 23-26th, 2011. 2011 Attended WIPO Symposium in Muscat-Oman, June 26-28, 2011. 2012 Attending celebration of Sultan Qabus Award for Crafts Excellence, March 2012. Organized Asia Pacific Handicrafts Week in Kuwait, during the 19th Qrain Festival annually launched by the National Council for Culture, Arts & Letters, 20-25th Jan,2013. 2013 Semarang 1st Batik International Festival, Indonesia, 3rd-5th May,2013, participated in Seminar and Exhibition. 2013 Held the Second Executive Board Meeting in Bishkek, Kyrgyzstan, July 27th, 2013. 2013 Attended the inauguration of OIMO/ International Forum-Felt Crossroads event in Bishkek, Kyrgyzstan, July 25-5th Aug,2013, and gave a speech. 2013 Attended WCC special meeting on UNESCO programme on “Award of Excellence for Handicrafts” and “Opening Ceremony” of “International Arts & Crafts Creative Competion-2014”, Dec 28-29th Dec,2013, in Beijing, China. 2014 Attended 3rd National Crafts Day & H.M.Sultan Qaboos Award of Excellence 2014 Celebration, March 3rd,2014, attended with WCC-IPP, in Muscat,Oman. 2014 Participated in the 1st East West & Africa Women Initiatives Forum-1st Conference: Topic: “Women as Elements of Change”, March 15-16th,2014, Princess Taghrid Institute, Amman, Jordan. Gave a speech. 2014 Attended 2nd WCC Board Meeting, April 10th,2014, in Atlanta Georgia, North America. 2014 Held the Third APR Executive Board Meeting in Muscat, Oman, June 2, 2014. 2014 A Member of the Jury for the Jurying of the World Crafts Council-Award of Excellence for Handicrafts for Asia Pacific Region 2014, Jakarta-Indonesia. 2014 Evaluation on Jogjakarta (Yogyakarta) City, Indonesia for World Crafts City for Batik, August 23-25, 2014. 2015 Evaluation of Mamallapuram City as WCC Craft City for Stone Carving, Mamallapuram, India, March 12, 2015. 1. Member of the Society of History and Archaeology, Gulf Cooperation Council. 5. Member of the American University of Beirut Alumni, Kuwait Chapter-Beirut,Kuwait. 6. 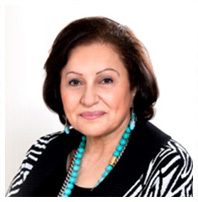 Member of the Board of Trustees of Hani Qaddumi Foundation, Amman, Jordan. 7. Member of MESA, USA. 9. Member of the Kuwait Women Cultural Social and Society. 1.Gulf Cooperation Council (GCC) Award for Achievements in the field of Antiquities and Museums, March, 2011, U.A.E., Dubai. 2. Lebanese American University (LAU) Award of Achievement, Beirut, Lebanon, Dec, 2013.